Most Americans say they think of scientists as neither politically liberal nor conservative, according to a Pew Research Center survey. The sharp political divide between Republicans and Democrats on issues such as climate change raises the question of whether a wide range of Americans’ attitudes about science – and scientists – are viewed through a political lens. Our survey of 2,002 adults nationwide, conducted in August 2014, suggests that’s not the case. 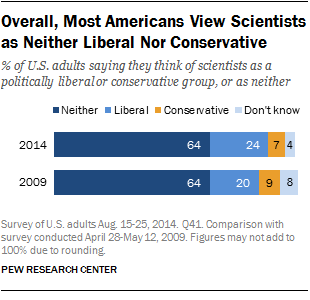 Some 64% of Americans perceive scientists as neither liberal nor conservative. Another 24% of adults think scientists are politically liberal and 7% say scientists are politically conservative. While the perception of scientists as politically liberal outnumbers the share saying scientists are conservative, these perceptions are roughly the same as in a 2009 Pew Research survey. A majority of both Democrats and Republicans think of scientists in ideologically neutral terms. But the view that scientists are generally liberal has grown among those who are, themselves, near the ends of the political spectrum. Some 42% of conservative Republicans think of scientists as politically liberal, up 14 percentage points from 28% in 2009. At the other end of the spectrum, liberal Democrats are also more likely than in 2009 to perceive scientists as generally liberal – 30% do so, up from 21%. 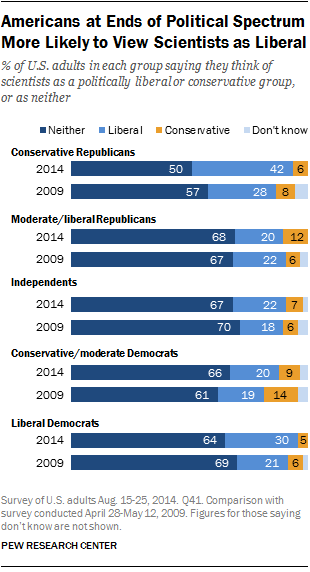 The views among other party/ideology groups have stayed roughly the same over this time period, however. Our report earlier this year found that even though Americans have become more divided in recent decades into ideological “silos,” the role of politics in views of science topics is not uniformly tied to party and ideological differences. Although Americans’ political leanings do influence their views about issues such as climate change and energy policy, they are much less of a factor when it comes to issues such as food safety, space exploration and biomedicine. At the same time, other factors, such as racial and generational differences, shape the public’s often-complex views on science matters.